Leave 2.0, enabling seafarers to access the internet in ports on tablet consoles. Together with Shore Leave, the Seafar- ers’ Trust believes that these initiatives will effect real change, attending to the global welfare of seafarers. Isuper-fast delivery of our online communications. For sea- downloads. Considered alongside similar charity-sector inno- farers, however, the unique environment of being away at sea vations such as tootoot – an app launched by Bullying UK for many months at a time challenges this norm. Access to a allowing children to report incidences of bullying directly to reliable Wi-Fi connection – both at sea and ashore – for most their place of learning – the app’s new reporting feature en- seafarers is hard to come by. For the ITF Seafarers’ Trust, the abling seafarers to leave reviews of centers visited will play launch of Shore Leave 2.0 aims to ? ll a gap in the provision of a role in helping funding organizations such as the Seafarers’ of? 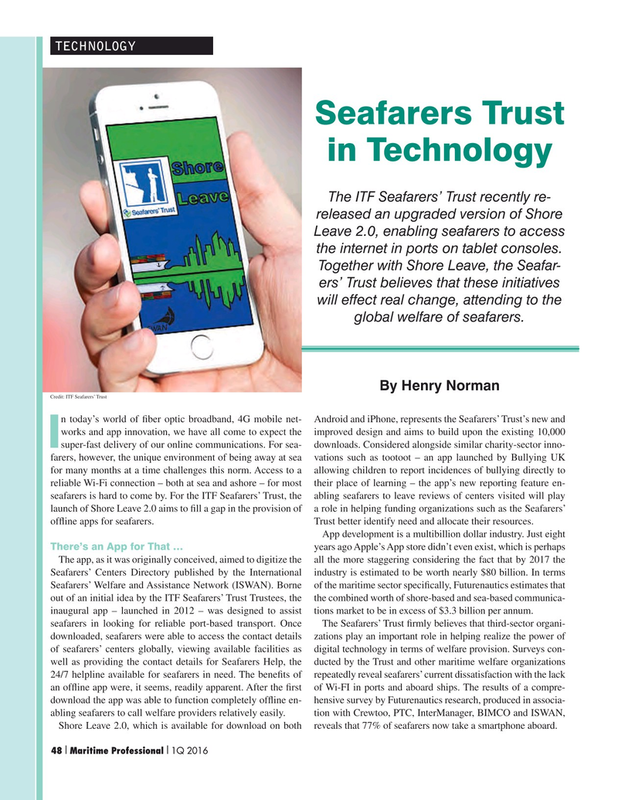 ine apps for seafarers. Trust better identify need and allocate their resources.